Plate tectonics, from Greek "builder" or "mason", is a theory of geology that has been developed to explain the observed evidence for large scale motions of the Earth's lithosphere. The theory encompassed and superseded the older theory of continental drift from the first half of the 20th century and the concept of seafloor spreading developed during the 1960s. The outermost part of the Earth's interior is made up of two layers: above is the lithosphere, comprising the crust and the rigid uppermost part of the mantle. Below the lithosphere lies the asthenosphere. Although solid, the asthenosphere has relatively low viscosity and shear strength and can flow like a liquid on geological time scales. The deeper mantle below the asthenosphere is more rigid again. This is, however, not due to cooler temperatures but due to high pressure. The lithosphere is broken up into what are called tectonic plates, in the case of Earth, there are seven major and many minor plates (see list below). The lithospheric plates ride on the asthenosphere. These plates move in relation to one another at one of three types of plate boundaries: convergent or collision boundaries, divergent or spreading boundaries, and transform boundaries. Earthquakes, volcanic activity, mountain-building, and oceanic trench formation occur along plate boundaries. The lateral movement of the plates is typically at speeds of 0.66 to 8.50 centimeters per year. The lithosphere essentially "floats" on the asthenosphere and is broken-up into ten major plates: African, Antarctic, Australian, Eurasian, North American, South American, Pacific, Cocos, Nazca, and the Indian plates. These plates (and the more numerous minor plates) move in relation to one another at one of three types of plate boundaries: convergent (two plates push against one another), divergent (two plates move away from each other), and transform (two plates slide past one another). Earthquakes, volcanic activity, mountain-building, and oceanic trench formation occur along plate boundaries (most notably around the so-called Pacific Ring of Fire). Plate tectonic theory arose out of two separate geological observations: continental drift, noticed in the early 20th century, and seafloor spreading, noticed in the 1960s. The theory itself was developed during the late 1960s and has since almost universally been accepted by scientists and has revolutionized the Earth sciences (akin to the development of the periodic table for chemistry, the discovery of the genetic code for genetics, or evolution in biology). The division of the Earth's interior into lithospheric and asthenospheric components is based on their mechanical differences. The lithosphere is cooler and more rigid, whilst the asthenosphere is hotter and mechanically weaker. This division should not be confused with the chemical subdivision of the Earth into (from innermost to outermost) core, mantle, and crust. The key principle of plate tectonics is that the lithosphere exists as separate and distinct tectonic plates, which "float" on the fluid-like asthenosphere. The relative fluidity of the asthenosphere allows the tectonic plates to undergo motion in different directions. Tectonic plates are comprised of two types of lithosphere: continental and oceanic lithospheres; for example, the African Plate includes the continent and parts of the floor of the Atlantic and Indian Oceans. The distinction is based on the density of constituent materials; oceanic lithospheres are denser than continental ones due to their greater mafic mineral content. As a result, the oceanic lithospheres generally lie below sea level (for example the entire Pacific Plate, which carries no continent), while the continental ones project above sea level. Transform boundaries occur where plates slide, or perhaps more accurately grind, past each other along transform faults. The relative motion of the two plates is therefore either sinistral or dextral. Divergent boundaries occur where two plates slide apart from each other. Convergent boundaries (or active margins) occur where two plates slide towards each other commonly forming either a subduction zone (if one plate moves underneath the other) or an orogenic belt (if the two simply collide and compress). Plate boundary zones occur in more complex situations where three or more plates meet and exhibit a mixture of the above three boundary types. The left- or right-lateral motion of one plate against another along transform or strike slip faults can cause highly visible surface effects. Because of friction, the plates cannot simply glide past each other. Rather, stress builds up in both plates and when it reaches a level that exceeds the slipping-point of rocks on either side of the transform-faults the accumulated potential energy is released as strain, or motion along the fault. The massive amounts of energy that are released are the cause of earthquakes, a common phenomenon along transform boundaries. A good example of this type of plate boundary is the San Andreas Fault complex, which is found in the western coast of North America and is one part of a highly complex system of faults in this area. At this location, the Pacific and North American plates move relative to each other such that the Pacific plate is moving north with respect to North America. At divergent boundaries, two plates move apart from each other and the space that this creates is filled with new crustal material sourced from molten magma that forms below. The genesis of divergent boundaries is sometimes thought to be associated with the phenomenon known as hotspots. Here, exceedingly large convective cells bring very large quantities of hot asthenospheric material near the surface and the kinetic energy is thought to be sufficient to break apart the lithosphere. The hot spot believed to have created the Mid-Atlantic Ridge system currently underlies Iceland which is widening at a rate of a few centimeters per century. Such hot spots can be very productive of geothermal power and Iceland is actively developing this resource and is expected to be the world's first hydrogen economy within twenty years. Divergent boundaries are typified in the oceanic lithosphere by the rifts of the oceanic ridge system, including the Mid-Atlantic Ridge, and in the continental lithosphere by rift valleys such as the famous East African Great Rift Valley. Divergent boundaries can create massive fault zones in the oceanic ridge system. Spreading is generally not uniform, so where spreading rates of adjacent ridge blocks are different massive transform faults occur. These are the fracture zones, many bearing names, that are a major source of submarine earthquakes. A sea floor map will show a rather strange pattern of blocky structures that are separated by linear features perpendicular to the ridge axis. If one views the sea floor between the fracture zones as conveyor belts carrying the ridge on each side of the rift away from the spreading center the action becomes clear. Crest depths of the old ridges, parallel to the current spreading center, will be older and deeper (due to thermal contraction and subsidence). It is at mid-ocean ridges that one of the key pieces of evidence forcing acceptance of the sea-floor spreading hypothesis was found. Airborne geomagnetic surveys showed a strange pattern of symmetrical magnetic reversals on opposite sides of ridge centers. The pattern was far too regular to be coincidental as the widths of the opposing bands were too closely matched. Scientists had been studying polar reversals and the link was made. The magnetic banding directly corresponds with the Earth's polar reversals. This was confirmed by measuring the ages of the rocks within each band. In reality the banding furnishes a map in time and space of both spreading rate and polar reversals. 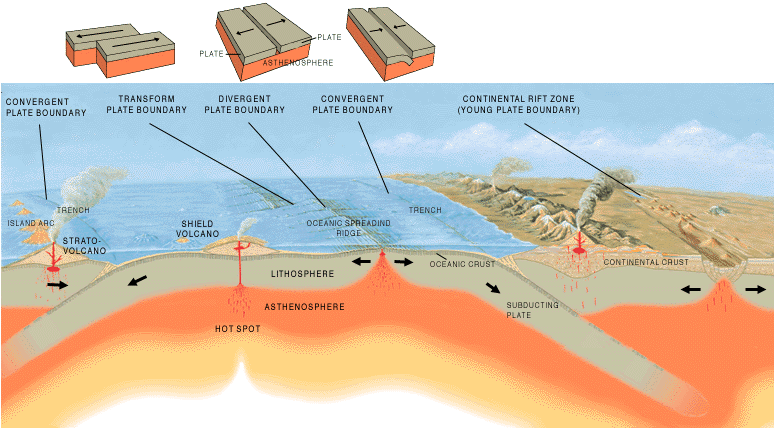 The nature of a convergent boundary depends on the type of lithosphere in the plates that are colliding. Where a dense oceanic plate collides with a less-dense continental plate, the oceanic plate is typically thrust underneath, forming a subduction zone. At the surface, the topographic expression is commonly an oceanic trench on the ocean side and a mountain range on the continental side. An example of a continental-oceanic subduction zone is the area along the western coast of South America where the oceanic Nazca Plate is being subducted beneath the continental South American Plate. As organic material from the ocean bottom is transformed and heated by friction a liquid magma with a great amount of dissolved gasses will be created. This can erupt to the surface, forming long chains of volcanoes inland from the continental shelf and parallel to it. The continental spine of South America is dense with this type of volcano. In North America the Cascade mountain range, extending north from California's Sierra Nevada, is also of this type. Such volcanoes are characterized by alternating periods of quiet and episodic eruptions that start with explosive gas expulsion with fine particles of glassy volcanic ash and spongy cinders, followed by a rebuilding phase with hot magma. The entire Pacific ocean boundary is surrounded by long stretches of volcanoes and is known collectively as The Ring of Fire. Where two continental plates collide the plates either crumple and compress or one plate burrows under or (potentially) overrides the other. Either action will create extensive mountain ranges. The most dramatic effect seen is where the northern margins of the Indian subcontinental plate is being thrust under a portion of the Eurasian plate, lifting it and creating the Himalaya. When two oceanic plates converge they form an island arc as one oceanic plate is subducted below the other. A good example of this type of plate convergence would be Japan. 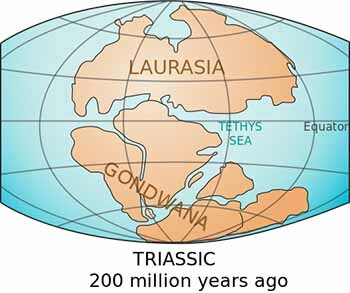 In paleogeography, Gondwana, originally Gondwanaland, is the name given to the more southerly of two supercontinents (the other being Laurasia) which were part of the Pangaea supercontinent that existed from approximately 510 to 180 million years ago (Mya). Gondwana is believed to have sutured between ca. 570 and 510 Mya, thus joining East Gondwana to West Gondwana. It separated from Laurasia 200-180 Mya (the mid-Mesozoic era) during the breakup of Pangaea, drifting farther south after the split. Gondwana included most of the landmasses in today's Southern Hemisphere, including Antarctica, South America, Africa, Madagascar and the Australian continent, as well as the Arabian Peninsula and the Indian subcontinent, which have now moved entirely into the Northern Hemisphere. The continent of Gondwana was named by Austrian scientist Eduard Suess, after the Gondwana region of central northern India (from Sanskrit gondavana "forest of the Gonds"), from which the Gondwana sedimentary sequences (Permian-Triassic) are also described. On September 7, 2017, a magnitude 8.2 earthquake struck southern Mexico, killing dozens and injuring hundreds. While earthquakes are common enough in the region, this powerful event wasn�t any run-of-the-mill tremor. That�s because part of the roughly 37-mile-thick tectonic plate responsible for the quake completely split apart, as revealed by a new study in Nature Geoscience. This event took place in a matter of tens of seconds, and it coincided with a gargantuan release of energy. Such colossal fragmentation events have been observed before in a handful of places around the world, and all these epic earthquakes have one thing in common: No one really knows how they happen. This information gap matters, because huge populations from the western seaboard of the Americas to the eastern shores of Japan could be threatened by these enigmatic earthquakes. A new study suggests that rapid cooling within the Earth's mantle through plate tectonics played a major role in the development of the first life forms, which in turn led to the oxygenation of the Earth's atmosphere. Scientists found that over the 4.5 billion years of the Earth's development, rocks rich in phosphorus accumulated in the Earth's crust. They then looked at the relationship of this accumulation with that of oxygen in the atmosphere. About 700 million years ago, the Earth experienced unusual episodes of global cooling that geologists refer to as "Snowball Earth." Several theories have been proposed to explain what triggered this dramatic cool down, which occurred during a geological era called the Neoproterozoic. Now geologists suggest that those major climate changes can be linked to one thing: the advent of plate tectonics. Plate tectonics is a theory formulated in the late 1960s that states the Earth's crust and upper mantle - a layer called the lithosphere - is broken into moving pieces, or plates. These plates move very slowly - about as fast as your fingernails and hair grow - causing earthquakes, mountain ranges and volcanoes. Geologists matching rocks from opposite sides of the globe have found that part of Australia was once attached to North America 1.7 billion years ago. Researchers from Curtin University in Australia examined rocks from the Georgetown region of northern Queensland. The rocks - sandstone sedimentary rocks that formed in a shallow sea - had signatures that were unknown in Australia but strongly resembled rocks that can be seen in present-day Canada. The researchers, who described their findings online Jan. 17 in the journal Geology, concluded that the Georgetown area broke away from North America 1.7 billion years ago. Then, 100 million years later, this landmass collided with what is now northern Australia, at the Mount Isa region. The Earth's history is written in its elements, but as the tectonic plates slip and slide over and under each other over time, they muddy that evidence - and with it the secrets of why Earth can sustain life. Scientists have discovered a microplate, which they call �Malpelo,� while analyzing the junction of three other plates in the eastern Pacific Ocean. It lies off the west coast of Ecuador. The Malpelo Plate, named for an island and an underwater ridge it contains, is the 57th plate to be discovered and the first in nearly a decade, say the researchers led by Rice University geophysicist Richard Gordon. They are sure there are more to be found. How do geologists discover a plate? In this case, they carefully studied the movements of other plates and their evolving relationships to one another as the plates move at a rate of millimeters to centimeters per year. It is the best depiction yet of the magnetism retained in Earth's rocks, as viewed from space. The map was constructed using data from Europe's current Swarm mission, combined with legacy information from a forerunner satellite called Champ. Variations as small as 250km across are detectable. Clearly seen are the "stripes" of magnetism moving away from mid-ocean ridges - the places on the planet where new crust is constantly produced. This pattern - the consequence of periodic changes in Earth's polarity being locked into the minerals of cooling volcanic rock - was one of the key pieces of evidence for the theory of plate tectonics. Tonga is a seismologists' paradise, and not just because of the white-sand beaches. The subduction zone off the east coast of the archipelago racks up more intermediate-depth and deep earthquakes than any other subduction zone, where one plate of Earth's lithosphere dives under another, on the planet. Tonga is such an extreme place, and that makes it very revealing. That swarm of earthquakes is catnip for seismologists because they still don't understand what causes earthquakes to pop off at such great depths. Tectonic plates may have inched across the Earth�s surface to where they are now over the course of billions of years, but they left behind traces of this movement in bumps and gashes under the sea. Now, a new topographic map of the seafloor has helped researchers chronicle when the Indian-Eurasian continent formed as well as find a previously undiscovered microplate that broke off as a result of the event. NASA�s Earth Observatory released the map on Jan. 13, and it reveals the complex topography of the planet�s seafloor. By analyzing these underwater peaks and ridges, researchers can decipher how and when the plates that made up the ancient supercontinent Pangaea tore apart about 200 million years ago, resulting in the birth of new ocean crust and the formation of mountain ranges. The map, which is bright blue and red like a heat map, was compiled by an international team of researchers using a gravity model of the ocean, which is in turn based on altimetry data from the CryoSat-2 and Jason-1 satellites. The continents may have first risen high above the oceans of the world about 3 billion years ago, researchers say. That's about a billion years earlier than geoscientists had suspected for the emergence of a good chunk of the continents. Earth is the only known planet whose surface is divided into continents and oceans. Currently, the continents rise an average of about 2.5 miles (4 kilometers) above the seafloor. The continents are composed of a thick, buoyant crust that's about 21 miles (35 km) deep, on average, whereas the comparatively thin, dense crust of the ocean floor is only an average of about 4 miles (7 km) thick. Because the continents are so thick and buoyant, they are less likely to get dragged downward. That's why so many ancient continental rocks have survived in the Earth's crust. Still, much about the earliest days of continents, and when and how they formed, remains hotly contested. The island Isla Santa Mar�a in the south of central Chile is the document of a complete seismic cycle. At the South American west coastline the Pacific Ocean floor moves under the South American continent. Resulting that through an in- and decrease of tension the earth's crust along the whole continent from Tierra del Fuego to Peru broke alongside the entire distance in series of earthquakes within one and a half century. The earthquake of 1835 was the beginning of such a seismic cycle in this area. After examining the results of the Maule earthquake in 2010 a team for the first time were able to measure and simulate a complete seismic cycle at its vertical movement of the earth's crust at this place. The Pacific Plate is broken as the plates slip-slide over each other causing major quakes and awakening volcanoes. In terms of plate tectonics, India is running into Asia at one and a half to two inches a year, leading to earthquakes. When an unstoppable force like the Indian subcontinent crashes into an immovable object like Asia, the consequences include the tallest mountains in the world and a cadence of earthquakes like the magnitude 7.8 one that struck Nepal last month and a major aftershock in the same region last week. A new study led by Michigan Technological University geophysicist Aleksey Smirnov reveals that 1.1 billion years ago, the North American tectonic plate scooted along at a blistering 24.6 centimeters - about 10 inches - per year. While it may not seem to be shattering any speed records, that's twice as fast as continental plates typically traveled in their wanderings over the earth's surface back in Precambrian times. Oceanic plates moved that quickly, but they are also much thinner, only 10 to 15 kilometers deep. Continental plates are up to 70 kilometers (43 miles) thick. These days, tectonic plates - 15-20 huge, interlocking pieces that make up the earth's crust - are even slower. Nevertheless, their movements are partially responsible for geological phenomena like earthquakes, volcanoes and mountain building. Pangea, the supercontinent that contained most of the Earth's landmass until about 180 million years ago, endured an apocalyptic undoing during the Jurassic period, when the Atlantic Ocean opened up. This is well understood. But what is less clear is how Pangea came into being in the first place. The puzzle pieces of tectonic plates are not rigid and don't fit together as nicely as we were taught in high school. A new study quantifies deformation of the Pacific plate and challenges the central approximation of the plate tectonic paradigm that plates are rigid. Oceanic tectonic plates deform due to cooling, causing shortening of the plates and mid-plate seismicity. Earth's tectonic plates are moving faster now than at any point in the last 2 billion years, according to the latest study of plate movements. But the result is controversial, since previous work seemed to show the opposite. If true, the result could be explained by another surprising recent discovery: the presence of more water within Earth's mantle than in all of the oceans combined. Plate tectonics is driven by the formation and destruction of oceanic crust. This crust forms where plates move apart, allowing hot, light magma to rise from the mantle below and solidify. Where plates are being pushed together, the crust can either rise up to form mountains or one plate is shoved under the other and is sucked back into the mantle. The Pacific tectonic plate is not as rigid as scientists believe, according to new calculations. Scientists have determined that cooling of the lithosphere -- the outermost layer of Earth -- makes some sections of the Pacific plate contract horizontally at faster rates than others and cause the plate to deform. The tectonic plates that cover Earth's surface, including both land and seafloor, are in constant motion; they imperceptibly surf the viscous mantle below. Over time, the plates scrape against and collide into each other, forming mountains, trenches and other geological features. The new calculations showed the Pacific plate is pulling away from the North American plate a little more -- approximately 2 millimeters a year -- than the rigid-plate theory would account for, he said. Overall, the plate is moving northwest about 50 millimeters a year. A cold, crusty shell of a planet that regularly kills off its occupants with violent earthquakes and massive volcanic eruptions doesn't sound like ideal habitat. But Earth's grinding plates, the source of its deadly tectonics, are actually one of the key ingredients that make it only planet with life in the solar system (found so far). Now, a new model seeks to explain why Earth's plate tectonics is unique among the sun's rocky planets. It all comes down to tiny minerals in rocks. The Earth's outer layer is made up of a series of moving, interacting plates whose motion at the surface generates earthquakes, creates volcanoes and builds mountains. Geoscientists have long sought to understand the plates' fundamental properties and the mechanisms that cause them to move and drift, and the questions have become the subjects of lively debate. Early life was confined to the sea and the process of terrestrialization -- the movement of life onto land -- began during the Silurian Period roughly 420 million years ago. The first wave of life to move out from water onto land consisted of plants, which gradually increased in size and complexity throughout the Devonian Period. This initial colonization of land was closely followed by plant and debris-eating invertebrate animals such as primitive insects and millipedes. By the end of the Silurian period about 416 million years ago, predatory invertebrates such as scorpions and spiders were feeding on the earlier colonists of land. The biggest jigsaw puzzle in the solar system has a split personality: The number and sizes of Earth's tectonic plates can flip, according to a new study. Today, the pieces of Earth's broken shell are unequal in size. Of about 50 plates, a mere seven account for 94 percent of the surface. The biggest, the Africa and the Pacific plates, are antipodal, meaning they sit on opposite sides of the Earth. But about 100 million years ago, the tectonic plates tiled the planet as evenly as a real-life jigsaw puzzle. Scientists are a step closer to solving part of a 165-million-year-old giant jigsaw puzzle: the breakup of the supercontinent Gondwana. Finding the past position of Earth's continents is a finicky task. But pinning down their wanderings plays a key role in everything from understanding ancient climate to how Earth's mountains and oceans evolved. Through "plate reconstruction" models, geoscientists illustrate how Earth's continents crunch together and split apart. Before it cracked into several landmasses, Gondwana included what are today Africa, South America, Australia, India and Antarctica. The big continents - Africa and South America - split off about 180 million to 170 million years ago. In recent years, researchers have debated what happened next, as the remaining continents rocketed apart. For example, different Gondwana reconstruction models had a 250-mile (400 kilometers) disagreement in the fit between Australia and Antarctica, an error that has a cascading effect in plate reconstructions, said Lloyd White, a geologist at Royal Holloway University in Surrey, England. Arrays of sensors stretching across more than 1,500 miles in Africa are now probing the giant crack in the Earth located there - a fissure linked with human evolution - to discover why and how continents get ripped apart. Over the course of millions of years, Earth's continents break up as they are slowly torn apart by the planet's tectonic forces. All the ocean basins on the Earth started as continental rifts, such as the Rio Grande rift in North America and Asia's Baikal rift in Siberia. The giant rift in Eastern Africa was born when Arabia and Africa began pulling away from each other about 26 million to 29 million years ago. 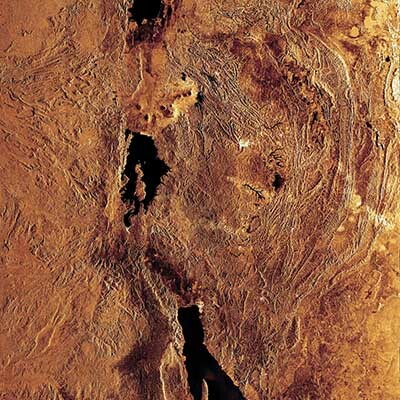 Although this rift has grown less than 1 inch (2.54 centimeters) per year, the dramatic results include the formation and ongoing spread of the Red Sea, as well as the East African Rift Valley, the landscape that might have been home to the first humans. Scientists at Scripps Institution of Oceanography at UC San Diego have found a layer of liquefied molten rock in Earth's mantle that may be acting as a lubricant for the sliding motions of the planet's massive tectonic plates. The discovery may carry far-reaching implications, from solving basic geological functions of the planet to a better understanding of volcanism and earthquakes.